For each and every ‘Testimonial’ we can furnish their phone number to you. Please feel free to give me a call. J & J Glass did a phenomenal job installing WinDoor Slider Series 4070 horizontal hurricane glass windows and sliders, V-100 tilt/turn windows and 8100 sliding glass doors in our high rise condominium. We kept putting off this purchase dreading the expense, the noise and the disruption of the installation. Then, Mark Waters came to see us… Every part of our purchase and installation when just as you laid out. The estimate was correct to the penny with no hidden costs. The crew was delightful and skilled. They arrived on time and cleaned up any mess before leaving in the late afternoon. The old windows came out and the new ones were installed in only four days. It was amazing! After the installation, you sent out your cleaning crew and they were awesome as well. My husband and I are truly amazed at the difference these windows have made in the comfort and appearance of our condominium. Of course, we expected that the days of soggy towels and mops would be over, but we have had other wonderful, unexpected benefits! For example, our electric bill has declined significantly. The windows are really beautiful. They cut the noise of the thunder storms and wind and pool noise to zero. 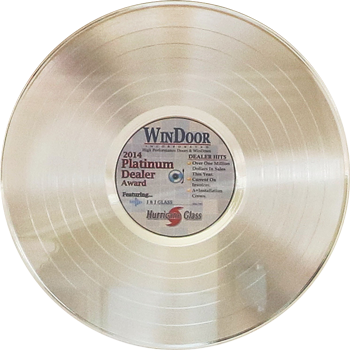 Our windows and sliders are weightless to operate-both the windows and screens slide silently and smoothly-like magic! Now we wish that we would have made this purchase years ago! Your installation crew were great to deal with and they performed magic in our unit. We have recommended J & J to our friends and many of them have decided to move ahead with J & J Glass. Now we are all very satisfied customers! As property manager of the Admiralty House Condominiums for over three years now I have had the pleasure of working with the folks from J&J Glass in Naples, Florida. After Hurricane Wilma we, as many other condominiums have had, many sliding glass doors blow out from their frames destroying the doors and frames. The Board of Directors put together a committee to research their options from a dozen licensed contractors they contacted. After extensive review the consensus was to hire J&J Glass for several reasons. They were able to meet our criteria for a quality replacement. They were able to perform their work in the time we required. They were also the lowest price for an equal type door product. Their staff was friendly, helpful, clean working and dependable. I would recommend J&J Glass to anyone. Just a note to tell you how pleased Minnie and I are with the quality of both the product and workmanship that went into the installation of our new windows and doors. The crew did a superb job, showed outstanding mechanical ability, and were motivated to do the job to the best of their ability. Minnie appreciated the caution used to prevent any damage to our apartment, especially to the carpeting throughout. I have already recommended J&J glass to a building contractor and will continue to do so to others as such opportunities occur. It is a genuine pleasure to do business with someone who places quality of performance and customer satisfaction at the top of his agenda. Regrettably it’s not all that frequent in the building trades. I want to thank you so much for all the great service you gave us during the installation of our hurricane sliders. It was extra ordinary! 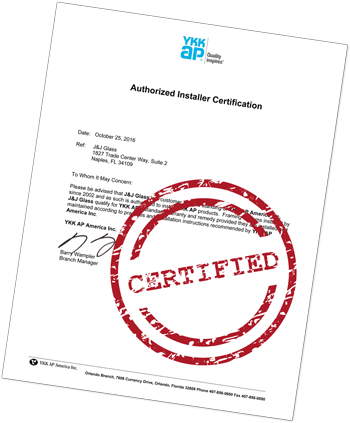 From the beginning, when you dealt with the Collier County permit, the lengthy well managed inspections with all the inspectors and last but not least, the professional installers who delivered every promised deadline. That too was extraordinary. We love our new sliders! They are making our surroundings quiet, peaceful and secure! I would recommend J&J Glass to anyone. Well Done! J&J Glass of Naples installed our new impact sliders in our beachfront condo on Marco Island and did a great job. They showed up on time and did what they said and that goes a long way in my book. I have referred my clients to Mark at J & J glass and will continue to do so. It’s a privilege to be able to recommend such a high quality company! Mark, I have been very pleased with J and J glass and their employees from the the very first condo that your firm did at the Admiralty House to the second condo at the Duchess. I want you to know that I could not be more pleased by the quality of the product and workmanship provided by your business. The windows and doors are aesthetically pleasing, quiet and easy to operate, along with providing that measure of security we all who are subject to hurricanes seek. Your work crews are well trained, efficient, polite and and considerate. The job is completed in a timely manner, and the crews remove all traces of evidence that they have been here. The cleaning service you provide afterwards is excellent, and truly a blessing, as this work does stir up a lot of dust! In a time when honest and reliable tradesmen can be difficult to find, it is a pleasure to be able to recommend your business highly. I commend you, Timothy, and your team, for the outstanding work and service provided during the installation of hurricane sliding glass doors in the lanai and kitchen of our condo in Naples, Florida. 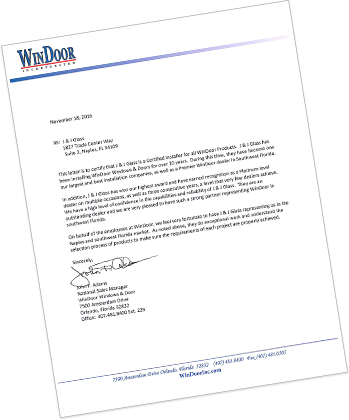 I also thank you for taking the time for reviewing the condominium rules and regulations regarding the installation of hurricane sliding glass doors in the building, under Florida’s updated construction code and safety requirements, and giving recommendations to improve the condominium rules and regulations on this topic. I am glad to be a reference of your service reliability, competence, and work ethics to ensure that the customer is well served and satisfied. My best wishes of continued business success and growth. I want to thank you for the very professional job your company did for us in replacing all the windows and sliders with impact glass in our beach-front penthouse condo. Because we are so thrilled with the impressive results and ease of working with your fine company, we decided to have you do the same in our second floor beachfront condo; both located in Marco Island, Florida. We were impressed with your friendly, courteous and efficient staff and workers. Our questions were always answered quickly and the jobs were completed in a timely manner. We have had many other condo owners in our building comment on the beautiful job J&J Glass did in both units. We highly recommend J&J Glass to anyone who may be in the market for glass replacement. We could’t be happier with our stunning new impact glass windows and sliders! Thank you again for two whole-condo jobs that were very professionally done. 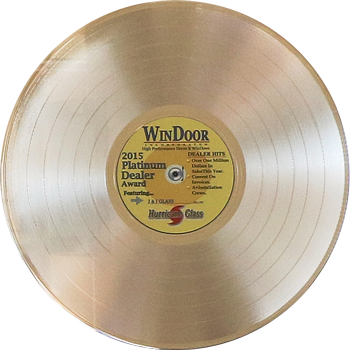 We just wanted to thank you for the excellent job that your company did installing our hurricane windows and doors. Your workers always arrived on time and were neat, courteous and professional. Any concerns that we might have had during the process were addressed immediately. As for customer service we could not be more pleased, you always responded personally to our calls/emails within a timely matter and if there was a problem a worker was sent to our home within a day or two. This is rare nowadays especially after a job is paid for. I know that to this day if I have a problem with one of my windows and or doors I could always rely on J&J Glass. Your customer service is truly excellent! Since you have done our installation we have recommended your company to at least 3 others who were equally satisfied with the job that you did. 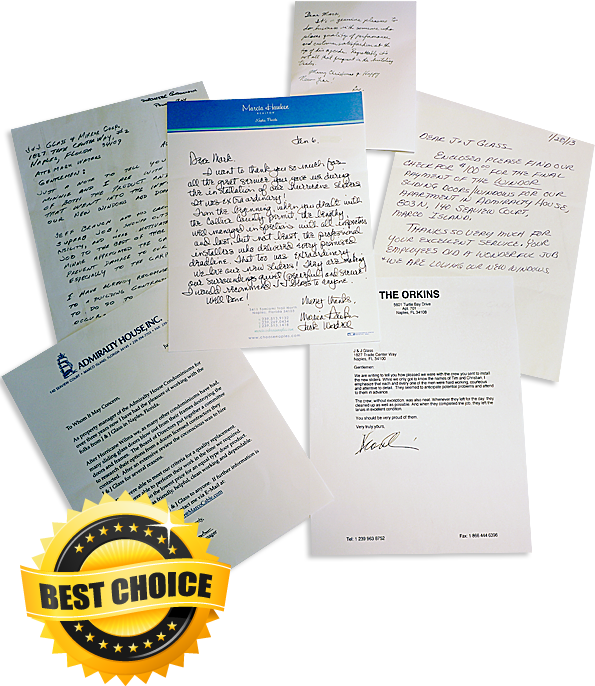 We would not hesitate to recommend your company in the future. This letter is to let you know how good of a job you have done for me not once, but on two separate occasions. After having used J&J for sliders in my condo and after having sold that condo a few years back, I did have the need to replace the sliders in my new condo and after much research both times, I did return to J&J for a multitude of reason. The bottom line was not necessarily the cost, which no one could beat, but the professionalism and friendliness from yourself and all of your employees. The product is professional, the workmanship was professional and all follow-ups, if needed, were and are professional. If we do sell our current condo, knowing that we will need beautiful sliders again, without question, we look forward to doing business with J&J. I do wish that all businessmen that I have associated with over the years were as competent as all of you. Admiralty House – Marco Island, Fl. We finally finished rebuilding our Pelican Bay condo unit before the St Maarten “hammer” rule kicked in on Nov 1. Our unit came out great. I want to thank you and your crew for adjusting your schedule to meet our General Contractor’s schedule. Your flexibility ensured we did not lose any time on the project. Jack complemented you as well and said you arrived, started, and finished as planned. The WinDoor windows have already protected us from a couple of small storms. The thicker glass limits all wind noise while our old doors sounded like we were in the middle of the storm. What a difference! Also, the larger wheels on the doors make the sliding completely silent. Our neighbors downstairs will really appreciate that! If you are ever in the building, stop in and check out the finished renovation. PS we will recommend you to others! When we bought our house in Pelican Bay, Naples, we wanted to give it a fresh, new look. The best place to start, after putting a new coat of paint on the walls, was replacing the doors. Hoping to find someone reliable and able to provide quality service, we hired Mark and his team and have not been disappointed. Mark’s professionalism and ability to deliver on the promise was impressive. There was no waiting around for various parts of the process to be completed as it’s usually the case with house improvement projects. His crew worked diligently and installed massive multiple panel sliding glass doors in our living room, kitchen, and bedroom within three days. The appearance and quality of the product was exactly what we were looking for. The sleek and modern door design was both practical, attractive, and easy to use. During the cooler months in Florida, we open our new doors from wall to wall and the house has an incredible new look – just like in a brochure! We give Mark our highest recommendation. Recently we replaced 6 sliders and several large bedroom windows in our condo. We contacted several installers and in the end went with J&J because of the knowledge and professionalism of Mark Waters and his team. Mark looked into what the former owner had done only to find out that the permitting was a mess or non-existent, the sliders were not properly installed (They cut crucial pieces in order to get them in the elevator which compromised the ability of the windows to protect against weather), and was able to get any outstanding issues resolved. 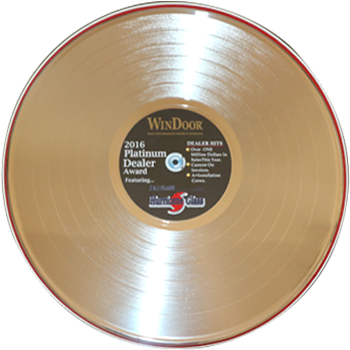 His knowledge of the Windor product line is very strong and he was able to get special colors ordered to match the existing windows in the rest of the building which other vendors said was not possible. He also knows the ins and outs of regulations, permitting, and the challenges of working in a high-rise condo building which made for a smooth installation in a timely manner which also saved us money in the long run. J&J did follow-up calls to make sure that everything was in good working order and made some small adjustments that were needed. Because of the quality of J&J’s work they have done numerous other units in our building as well as a major renovation for the common areas of our building. Mary and I would thank you and your team for the great work you did installing our hurricane rate sliders at the Duchess. From our original meeting through the final adjustments, we found each member of your team to be knowledgeable and friendly. As you know we have moved to the Prince Del Mar and will be contacting you after the first of the year for a proposal to replace some windows in our new unit. with them. Please know that we will be a reference for you.